This blog post is part two in a three-part series on integrating 3rd party native SDKs into Codename One application. I recommend you start with part one in this series as it will give you much-needed context to understand the procedures described in part two and three. In part one, we described the design and development of the public API and native interfaces of the Codename One FreshDesk library. In this installment we’ll move onto the development of the Android side of the native interface. Now that we have set up our public API and our native interface, it is time to work on the native side of things. 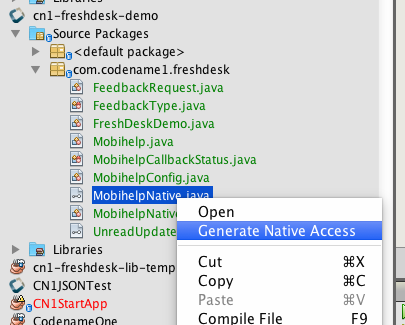 You can generate stubs for all platforms in your IDE (Netbeans in my case), by right clicking on the MobihelpNative class in the project explorer and selecting "Generate Native Access". Inside the android directory, this generates a com/codename1/freshdesk/MobihelpNativeImpl class with stubs for each method. Our implementation will be a thin wrapper around the native Android SDK. See the source here. (Note here that the activity() method is another convenience method to retrieve the app’s current Activity from the AndroidNativeUtil class). The SDK includes only Java classes - NO XML UI files, assets, or resources that aren’t included inside a simple .jar file. In this case, you can just place the .jar file inside your project’s native/android directory. The SDK includes some XML UI files, resources, and assets. In this case, the SDK is generally distributed as an Android project folder that can be imported into an Eclipse or Android studio workspace. In general, in this case, you would need to zip the entire directory and change the extension of the resulting .zip file to ".andlib", and place this in your project’s native/android directory. The SDK is distributed as an .aar file - In this case you can just copy the .aar file into your native/android directory. 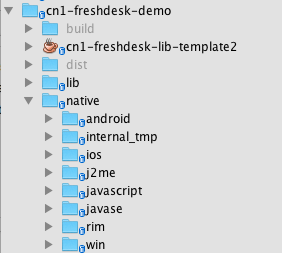 The FreshDesk (aka Mobihelp) SDK is distributed as a project folder (i.e. scenario 2 from the above list). Therefore, our procedure is to download the SDK (download link), and rename it from mobihelp_sdk_android.zip to mobihelp_sdk_android.andlib, and copy it into our native/android directory. Mobihelp SDK depends on AppCompat-v7 (Revision 19.0+) Library. You will need to update project.properties to point to the Appcompat library. I.e. it is expecting to find the appcompat_v7 library located in the same parent directory as the Mobihelp SDK project. After a little bit of research (if you’re not yet familiar with the Android AppCompat support library), we find that the AppCompat_v7 library is part of the Android Support library, which can can installed into your local Android SDK using Android SDK Manager. Installation processed specified here. appcompat-v7-19.1.0.aar - This is the actual library that we need to include in our project to satisfy the Mobisdk dependency. Looks like this library is pure Java classes, so we only need to include the support-v4-19.1.0.jar file into our project. Checking the .pom file we see that there are no additional dependencies we need to add. And since our Mobihelp SDK lists the appcompat_v7 dependency path as "../appcompat_v7" in its project.properties file, we are going to rename appcompat-v7-19.1.0.aar to appcompat_v7.aar. The final step on the Android side is to inject necessary permissions and services into the project’s AndroidManifest.xml file. android.xpermissions - For your <uses-permission> directives. Add a build hint with name android.xpermissions, and for the value, paste the actual <uses-permission> XML tag. android.xapplication - For the contents of your <application> tag. We’ll want to merge this and then paste them into the build hint android.proguardKeep of our project. If, after doing all this, your project fails to build, you can enable the "Include Source" option of the build server, then download the source project, open it in Eclipse or Android Studio, and debug from there. In the third and final part of this blog series, we will shift our focus to the iOS side of the library.